The most recent Metropolitan Area created some major shifts in Connecticut, where metro areas are more closely aligned by county borders than towns and townships as in the old New England structure. As a result, two important and highly diverse metro areas, Danbury and Stamford-Norwalk were merged into this now very large and complex Bridgeport area. Formerly a whaling port, Bridgeport itself grew up as an industrial and manufacturing center known for large machinery and brass products. Some of this heavy industry still remains, but general industrial decline has left considerable areas of blight. The area’s story is far more complex today. Particularly in combination with other centers along the Long Island Sound and major commute lines, the area has emerged into a major corporate center for headquarters and financial operations. Surrounding cities Fairfield, Stratford, and Trumbull provide a variety of suburban living environments and are within commuting distance of New York. Closer to New York, Stamford, Norwalk and Greenwich bring some additional older industrial infrastructure and corporate functions but more importantly areas of very attractive and affluent commuter suburbs. 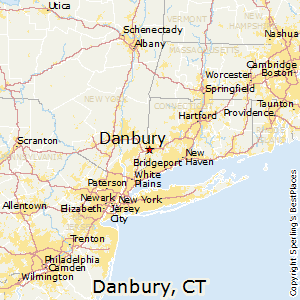 Danbury is an attractive smaller city with a diverse commercial base, low crime, attractive rural areas nearby, and again, proximity to New York but a bit outside practical commute distance. Smaller classic New England-style towns, like Newtown, lie between Danbury and the shore mainly east and south offering excellent residential opportunities. The economy, needless to say, is diverse and offers a lot of high paying jobs especially for those willing to make a lengthy commute. The affluence, high property values and high property tax rates, which are among the highest in the nation, make the area challenging for migrants or younger families starting out, although other taxes are relatively modest. Many older sections especially near Bridgeport are industrial with low educational attainment and high crime, while most of these issues are avoided further inland. Sea breezes and the proximity of the Long Island Sound tend to moderate temperatures both in summer and winter, and also to reduce winter snows for areas along the shore. Summer temperatures may be 5 degrees to 10 degrees lower than nearby inland locations, and winter snowfalls average 10 inches less. Summers are warm and humid, while winters are variable and might be punctuated with heavy “noreaster” snowstorms. Short periods of bitter cold can occur, but are usually shorter in duration than their counterparts in more northerly, inland locations. High tides and large coastal Atlantic storms can create flooding in low-lying areas. First freeze is end of October, last is mid-April. The median home price in Danbury is $276,100. Browse Homes in this Range. Compare Danbury, Connecticut to any other place in the USA.